Hi Linda!You don't even know how happy it makes me to hear that you are creating a new book!!!Aaaaaaa!! !So excited!I can only imagine what a hard work it is but like you wrote so much to learn from. 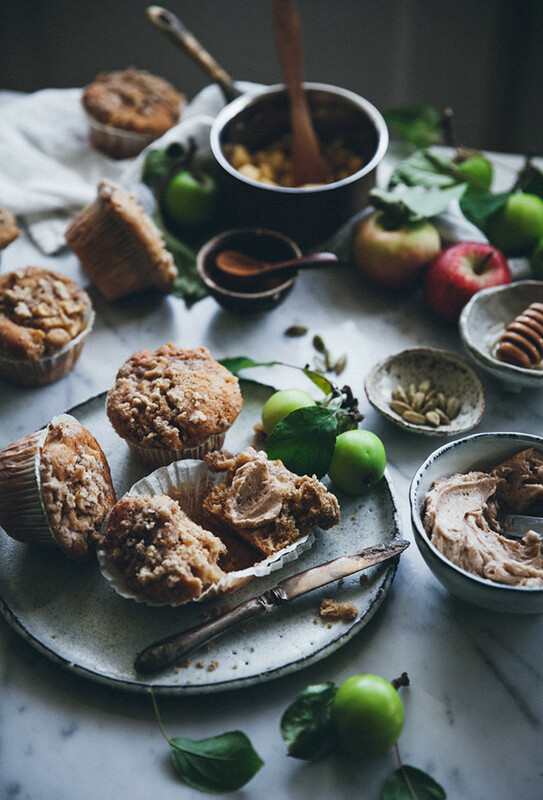 These muffins just scream warm fall days! Or even a cold day and having the kitchen smell of delicious baked goods! I am soooooo excited about your upcoming book! Can't wait! Yaaaay! Thanks so much Amy!! These muffins look amazing. The flavour combinations that you have conjured up are inspiring. I also adore the bowls and plates you have used, I've been looking for something like that for a while. Lovely photos and recipes. Another cookbook? How exciting!! I can't wait to see what you make this time, since Lomelino's Cakes is probably my favorite cake book ever 😀 Love these muffins, perfectly autumnal! Aww, aren't you sweet 🙂 Thank you June! I hope you'll like the subject of my new book! 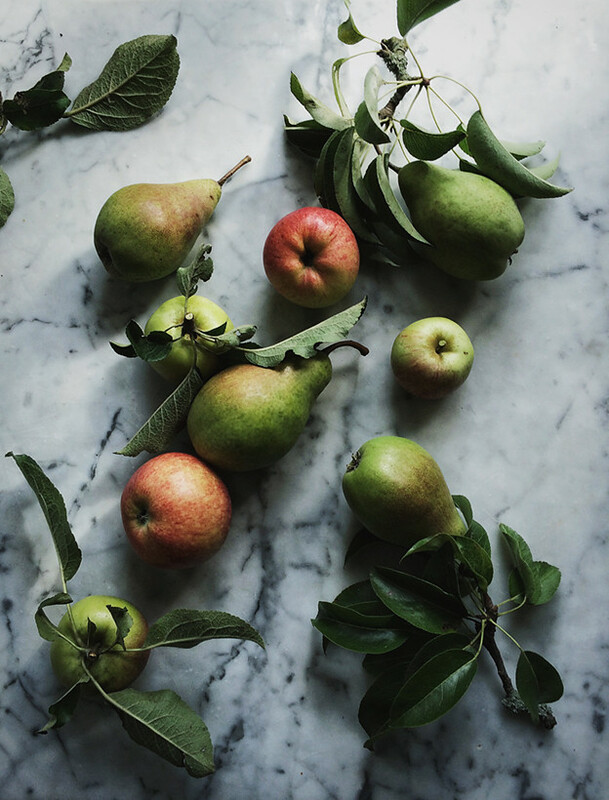 Apples are the best autumn fruit. They taste amazing when steamed with spices. I fell in love with cardamom when I spent a semester in Finland, I didn't know so much the spice before, but I see that in Scandinavia is quite popular. These muffins look delicious! Apples are the best!! That is true, it is very popular in baked goods here! I absolutely love cardamom 🙂 And thanks! These are so incredibly lovely! 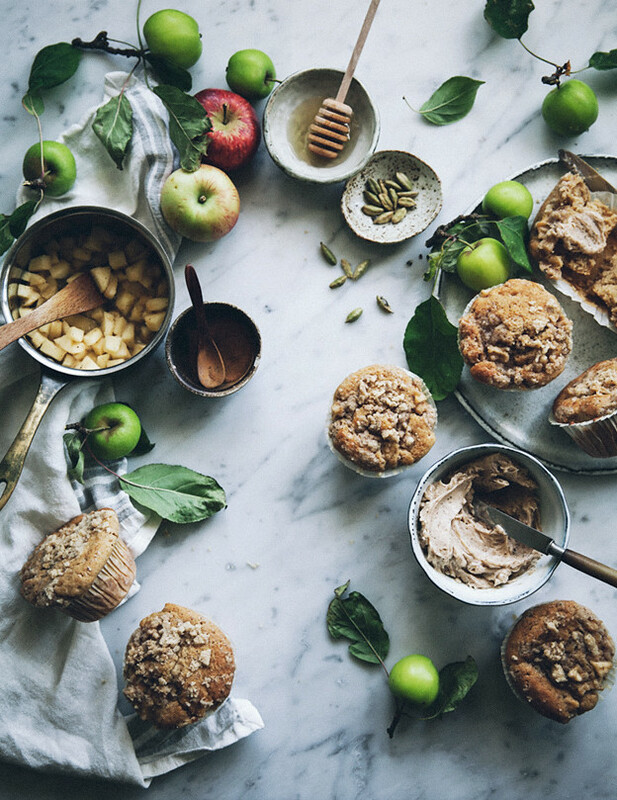 I love baking with apples too! And these muffins sound fantastic. I love the cognac in the apple filling AND that honey butter soooo much! Yum! wow! your work is filled with inspiration. Can't wait to get my hands on your new cookbook 🙂 And those muffins sounds incredible! Underbara foton! Gillar också kardemumma. Jag har börjat ha en liten gnutta i te ibland också. Tack! <3 Åh, det låter gott. Måste prova! Me too!! It's actually the first time I tried cognac! 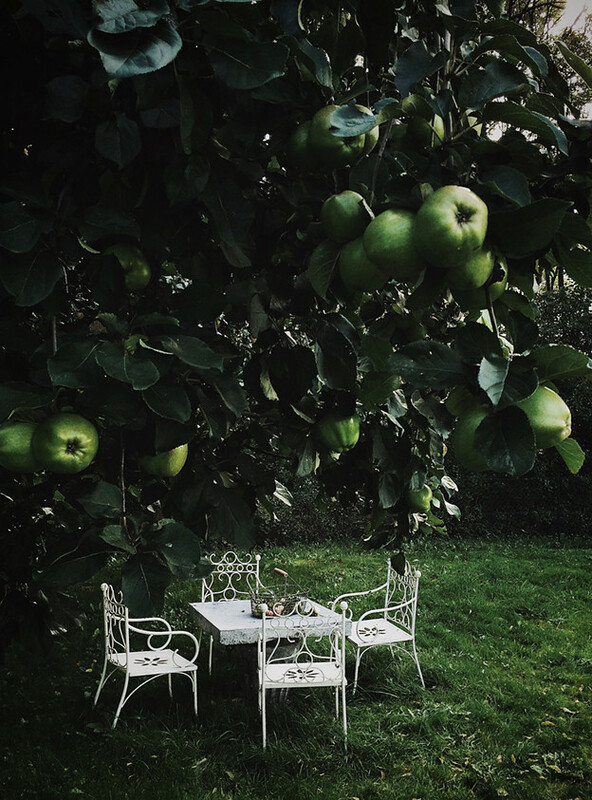 Haha, I would love to have a patio like that too… it belongs to the sweet girls of Food Stories! 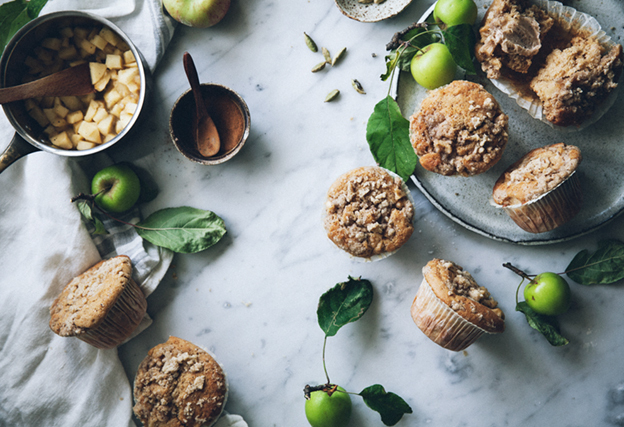 I adore these muffins, the streusel topping is so tempting! I really love your work and those look especially yummy. Can I please ask were you got those cute muffin cups with the frilly edges from? I've been looking for something similar in London and can't seem to find them. They look like the same ones used in by a bakery here in London called Peyton and Byrne. Thanks! Although they're out of stock now. Wow, yum, yum, yum!! 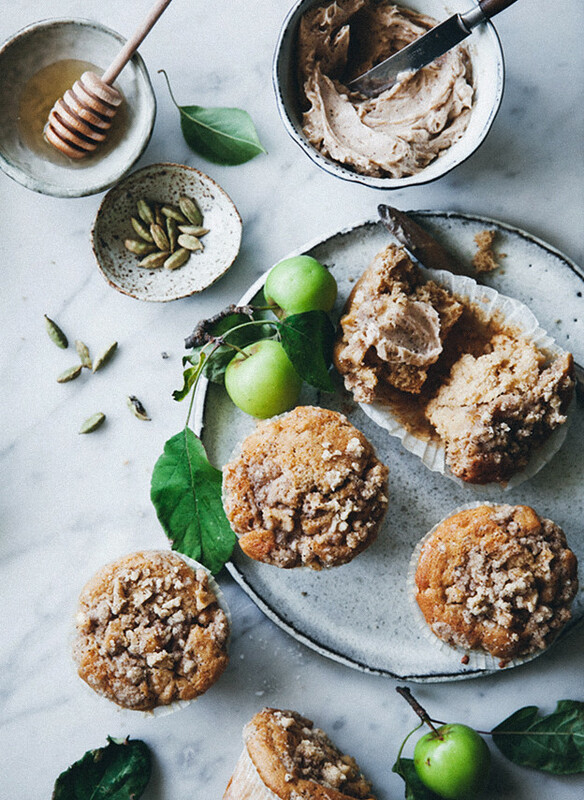 Love the combo of apple, cardamom and honey butter (!!). Apples always have me running to the kitchen, there's really nothing like a warm quick bread with soft and sweet apples. 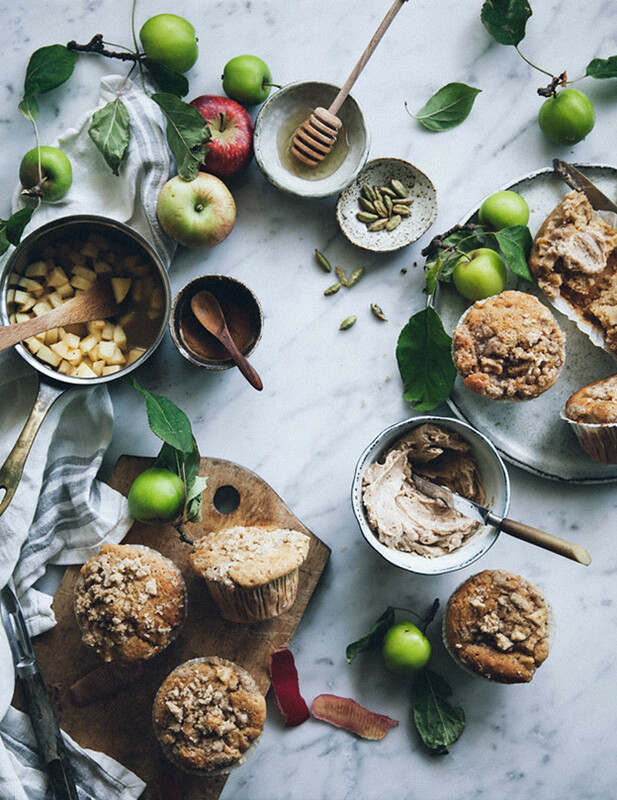 Your photos are absolutely stunning as well, I will no doubt be running to get some apples to make these muffins soon! It really is a great combo! Apples truly are the best.. And thank you so so much! I love streusel so will definitely give this a try! Wow! This looks so good, that I am going to try it – although my husband is a little bit skeptical if his recipe can top your double chocolate/banana one. Just a question, as we live in Germany, can you tell me the fat % of the sour cream you used for this? I do not want to use the wrong ingredient.. Many thanks and looking forward for your new book! Hehe, well, if he's a chocolate person, these might not be what he wants… Let me know what you think if you give them a try! The fat content of sour cream is around 12%. These muffins looks so yummy! Your pics are amazing.. as usual! I have been following your blog for a while now though I have never commented. I wanted to let you know that I think your photography is absolutely stunning. I love the way you incorporate nature into your pictures, the flowers, the leaves, the fruit, it's all beautiful. Thank you so much Michaela for your super sweet words! Glad you enjoyed the recipe 🙂 Calvados sounds amazing with this!